The American retail scene is often marked by anonymity: We consumers are hardly ever touched by the stories of the actual people who make the products we buy. Too often, we may not think about those people and what their lives may be like. Whole Foods Market (WFM) just launched a product that reminds us of the good our dollars can do. Whole Foods Market's new initiative with Comfort the Children and Allegro Coffee allows shoppers to make a direct, positive impact on Kenyan women and special needs children through products called LIFE Jackets. LIFE (Livelihood, Investment, Financials, and Empowerment) Jackets are reusable canvas cup sleeves that protect the environment as well as your hands from hot beverages. All 99 cents of each cup sleeve that Whole Foods sells goes straight to Comfort the Children, a nonprofit that helps poor Kenyan mothers with special needs children. Through the program, the mothers can learn the sewing trade and make the LIFE Jackets on-site where their kids are going to school. The initiative is even more inspiring because in Kenya, mothers with special needs children are subject to particular challenges to survival: They are often blamed for their children's disabilities and shunned by the rest of the community. Through Comfort the Children, these women not only learn a trade, but they make money for food and education for their children and improve their own standing in their communities. This initiative is a great example of why Whole Foods Market is such a successful company. It differentiates itself from many other American retailers: Its business is focused on operating with real inspirational purpose and generating healthy profits. More conventional companies like Walmart (WMT), Safeway (SWY), Kroger (KR), and so forth conduct corporate social responsibility initiatives, but Whole Foods has its do-good principles built into its corporate DNA. 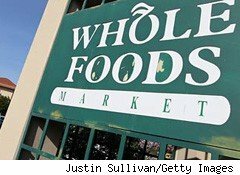 Whole Foods regularly gives to local food banks and shelters and donates funds to local community causes (on several "5% days" each year, 5% of all sales are donated to specific organizations deemed important by local stores). The organic grocer also provides low-fee, low-interest loans to small, local American farmers and producers that supply products for its shelves. Whole Foods recently launched initiatives to combat childhood obesity in the U.S., working with schools on programs like setting up "teaching gardens" to nurture kids' love for fruits and vegetables. The grocer's good works extend beyond our own backyard. The Whole Planet Foundation also provides microloans to people in struggling communities all over the globe, in regions from which it sources many products. Meanwhile, teaming with Comfort the Children and Allegro Coffee on LIFE Jackets gives shoppers a direct idea of the power of their dollars, and exactly whom they can help. Initiatives like this one remind me why I'm a Whole Foods fan (and shareholder); it exemplifies how the best companies excel by doing good in the world. Whole Foods reminds us that the money we spend can go far beyond our own creature comforts and help give people opportunities they didn't have before. That's good business.